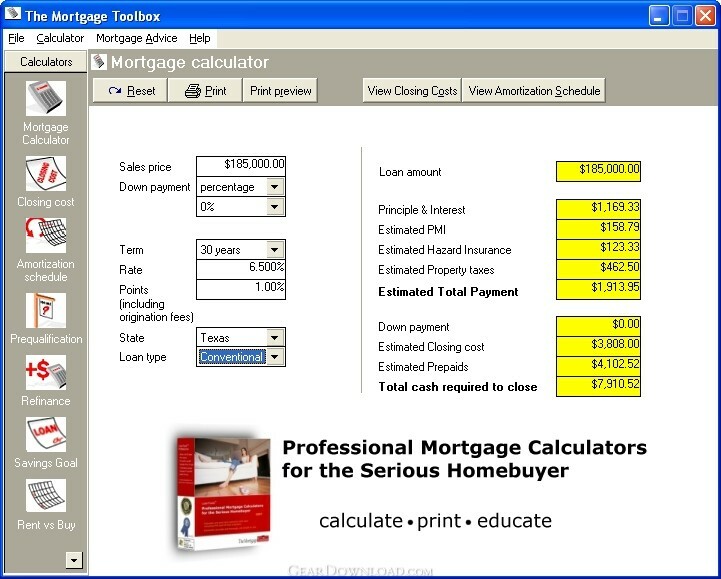 Professional Mortgage Calculators for the Serious Homebuyer. Extremely powerful and easy-to-use mortgage calculators are finally here. You will be able to calculate your total house payment including taxes, insurance and PMI without guessing or bogus results! You can also pre-qualify yourself with ease, calculate closing cost, figure interest-only payments, estimate cash-to-close requirements, calculate FHA and VA loan programs, run refinance scenarios, print amortization schedules, print detailed reports, plus much more. These calculators are designed to use local property tax, homeowner's insurance and closing cost figures for your state. No other mortgage calculator on the market does all this with such ease! "Made for a first-time homebuyer, but pwerful enough for a real estate professional"
This download (MortgageTools_3_3_0.exe) was tested thoroughly and was found 100% clean. Click "Report Spyware" link on the top if you found this software contains any form of malware, including but not limited to: spyware, viruses, trojans and backdoors. iCash 7.5.9 - Personal Finance and Office / Home accounting software. Home Loan Interest Manager Pro 7.1.130115 - Is your mortgage one of the thousands being overcharged interest EVERY DAY? AcreSoft Credit Card Butler 2 - Keep track of all your credit card spending. Avoid over-the-limit fines. Simple Money Keeper 2007 2.0.0 - Simple to learn and use personal finance software. Mortgage Watchdog Pro 6.0 - Mortgage Watchdog Pro - Mortgage Checker finds errors in your bank statement. GiftBox Plus 4.5.9 - Gift and idea tracker for any occasion. Track gifts given, received, ideas, etc. Star Check Writer 4.00 - Star Check Writer Software - Prints on your personal check book checks. Mortgage Statement Checker Bank Errors 7.1.130115 - Mortgage Statement Checker - Is your bank overcharging you interest EVERY DAY? Mortgage Loan Interest Manager Pro Mac 7.1.130115 - Is your mortgage one of the thousands being overcharged interest EVERY DAY?